Typically, my blog is devoted to musical theatre since that is the genre I am most interested in writing about. It doesn’t mean that I don’t attend plays as well. In fact, I enjoy a good play as much as I enjoy a good musical. I choose, however, to focus my writing on musicals in order to set myself boundaries so that I don’t go off on tangents on every topic that inspires an opinion in me. Every once and a while, however, I see a play that is so stirring and evocative that I have to set aside my rules and go on a tangent anyway. 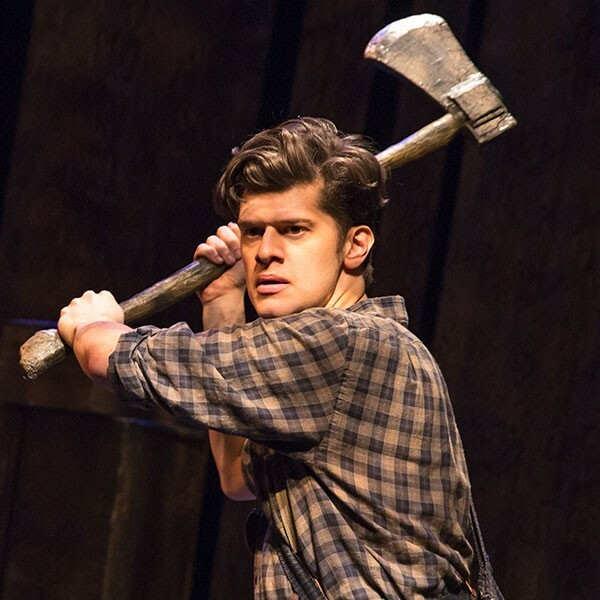 The Woodsman, conceived and written by James Ortiz and executed to haunting perfection by the Strangeman & Co. ensemble, is a show that simply grabbed a hold of me and refuses to let go and I have to write about it. Inspired by a story in the novel The Wonderful Wizard of Oz by L. Frank Baum, The Woodsman tells the tale of Nick Chopper, a woodland lumberjack who falls in love with a Munchkin girl who is the slave of the Wicked Witch of the East. In order to keep the girl from leaving her for the young man, the midnight hag enchants Nick’s axe so that it dismembers him, one limb at a time, until he is entirely crafted of tin prostheses. It isn’t until the final blow when the blade severs his torso that he can no longer love the girl because he has no heart. Left with only his woodcutting to fill the void, he stands in the woods, swinging his axe in a rainstorm, until he is rusted solid. The lights fade on him awaiting a little girl named Dorothy to rescue him. This story has always been one of the most heartbreakingly emotional in Baum’s Oz books, and in envisioning it for the stage, Ortiz and Company have not only found the magic in Oz, but they have also found the sinister, foreboding tone that permeates the original novel. Oz has always been a violent place full of terrible beasts, horrific witches, spooky forests and black magic. When you enter the theatre you are immediately drawn into this rustic world thanks to Ortiz’s (he wears many hats) set design made up of gnarled tree branches, curtain panels indicating larger trees, tiny picture frames full of black and white photographs, and hundreds of golden flickering candles suspended in glass jars. It all conjures visions of misty covered forests and mountains in rural Appalachia, the same witching world that made up the 1945 play Dark of the Moon. You can almost feel a cool, uncomfortable breeze blowing through these woods, a wind that might be carrying some unseen but palpable evil. The ensemble appears on the stage with the quirky Ortiz acting first as the narrator, reciting a mystical poem that tells the story of the Munchkin people and how they are enslaved by an all-seeing, all-hearing, all-knowing witch. As a result, the people move around in quiet for fear that their words will lead to trouble. Going forward, most of the play is told in pantomime: the story of how Nick Chopper’s parents met, the tale of how he fell in love with the slave girl, and the tragedy of how he was relegated to a life as a man of tin. Through the use of actors making woodland sound effects, the woods take on a life of themselves with their myriad clicks, crackles, whooshes and birdsongs. Bunraku puppetry, in judiciously spare but startling moments, is utilized to represent a flock of evil crows, a mammoth monster known as a Kalidah, and as the Wicked Witch herself in her rasping, grunting, haggard personification of evil incarnate. Though these are all clearly puppets, they are alive nonetheless, breathing, emoting. The final puppet is that of the Tin Woodman in his metallic form, and if his lumbering frame and sad visage don’t tear you into shreds, then perhaps it is you who needs of a journey down the Yellow Brick Road to ask the Wizard of Oz for a heart. Throughout the piece, there is a glorious folk music score composed by Edward W. Hardy (music) and Jen Loring (lyrics), much of it a mournful, melancholy commentary on the story. One imagines it being sung atop a lonely mountain at dusk as an echoing prayer to some ghost of a memory that we long to resurrect (or that we are perhaps clinging to). The music is consuming and heartbreaking, an emotional thread throughout the piece that is accentuated by an ongoing violin solo hypnotizing us into the world of Nick Chopper. As I mentioned earlier, The Woodsman is not a musical, but it sometimes feels like one. Directors Ortiz and Claire Karpen embrace a seamless flow for the show, sending us gliding on the same emotional clouds that buoyed the more thoughtful, heartfelt pieces of musical theatre over the years. 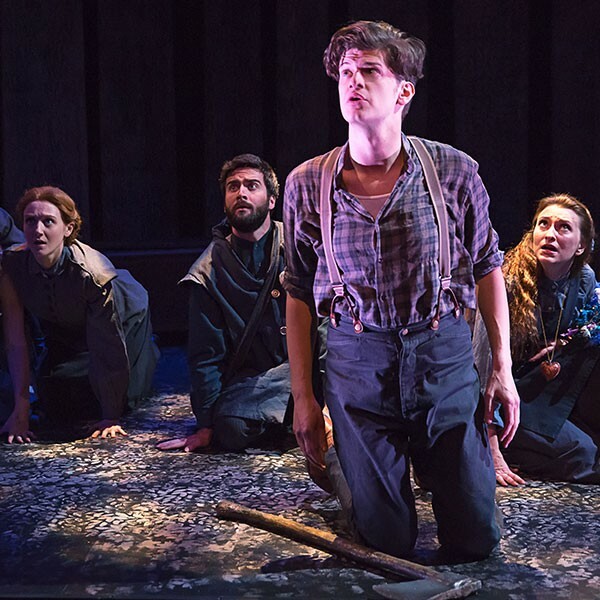 It is hard to single out any one performer in The Woodsman because the entire “well-oiled” ensemble works so effectively in tandem with one-another that it is sometimes hard to remember where one performer ends and another begins. Still, it is Ortiz’s Nick Chopper who is at the very “heart” of the story and he shines brilliantly long before his tin exterior naturally reflects the light. You feel every emotion tethered to every heartbeat: his love for his parents and then for the slave girl Nimmee, his anguish over his parents’ death, his confusion by the pangs of first love, and his devastation at finding himself supposedly incapable of loving sans heart. As Nimmee, Eliza Simpson embodies strength, earthiness, and resolve, her tentative exterior peeled away by the love of a simple Munchkin boy and her courage ignited by the possibilities it brings to her life. Remember that all of this is achieved with a minimum of words, the actors conveying so much with the body. It’s magical. 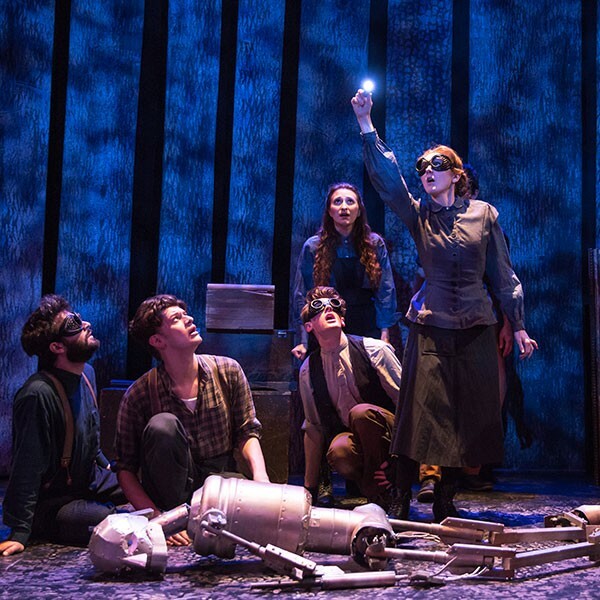 The Woodsman is unlike anything I have ever witnessed before on the stage, but reminiscent of fragments of some of the most inspiring theatre I have ever encountered. It’s many creative and unique touches elevate it to something out of the realm of the usual. The Woodsman is a special piece of theatre that should not be missed. I believe it will crawl inside both your mind and your heart and haunt you for days to come, just as it did me. Aren’t we all onboard for that kind of transformative theatre experience that so rarely happens these days? It’s the kind of theatre that is so engaging that you forget to breathe. It will most certainly leave you breathless.